The quote above is from ‘Twilight’. I read the first book on Monday and last night I read the entire second book, “New Moon”. It’s safe to say that I’m completely hooked and that my day job is currently interfering with me spending more time with Edward Cullen. I haven’t seen the movie yet. I’ve decided to wait until I’ve read through the rest of the series first. The premise of the books is that a young teen girl falls in love with a hot vampire and misadventure ensues. It certainly isn’t for everyone, but I’m so pre-disposed to teen drama. My So-Called-Life, Dawson’s Creek, Felicity, Gossip Girl – you name it, I love it. I’m curious if this obsession will ever end or will I still be hooked on the lives of fictional teens in twenty years? The quote is typewritten on muslin and stitched to the inside pocket of my new Birdie Sling. I forgot to press the space bar between two words, so it’s not perfect, but that’s the charm of the typewriter. There is no delete button. It was definitely time for a new bag. After six months of daily use, Birdie Sling #1 needed to retire. Plus, I wanted to be a bit matchy and make something to go with my new coat. I did a couple things differently this time. Instead of fusible interfacing, I just basted a layer of washed cotton muslin to all of the bag’s pieces. I really like how this turned out. I often find fusible interfacing rather frustrating when it bubbles and doesn’t stick properly. 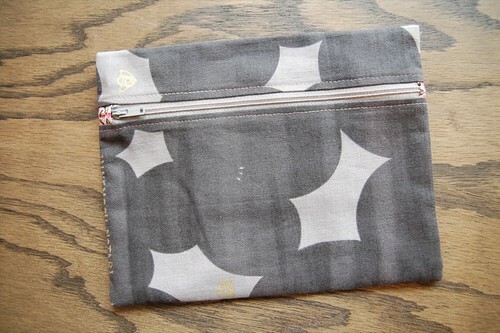 For the pockets, I turned the small pocket into a zippered pocket to add a secure spot to keep my ipod, phone charger and lip balm. I also made a matching zippered pouch for my Shinzi Katoh agenda. This way I can keep my pens, cheque books and business cards altogether. This system is working out really well for me and makes me feel like I’m making progress with my life-long wish to be more organized. But really – Twilight, anyone? 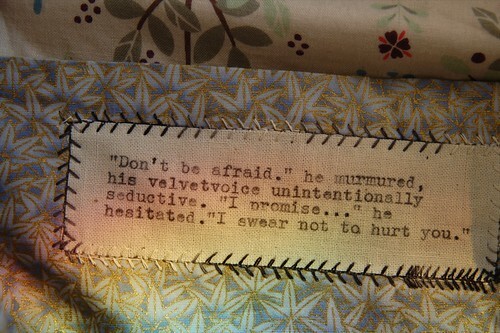 I LOVE the idea of stitching a favourite quote inside a purse pocket! I will have to try that next time I make one. I have been putting off seeing AND reading Twilight. I can’t really say why. I do love me some teenage drama though (Felicity, Pretty in Pink, etc.). And I have really been enjoying the new vampire-ish tv show True Blood. Hmmm… I might cave and buy the Twilight book. first gossip girl and now twighlight? i am trying not to think less of you when the truth is that i don’t have access to these things and certainly feed myself a steady diet of similar-yet-different pablum. i mean, aitor and i know infomercials off by heart. we even have favorites. and i think the last major book i read was christine by stephen king and it actually scared me. i’m an idiot. but i still want to lend you some hunter s. thompson. Ha! Oh my goodness. I love the teen dramas but Twilight, I cannot do. I tried. My friend the YA librarian loves the Twilight books, so I thought I would listen to it in audiobook format. I can’t do it. I can’t finish it. I just don’t care what happens. I know a lot of people turn up their noses at audiobooks, but I think they really draw out how strong or how poor the writing is. The narrator of the audiobook has this accent that turns the word “forward” into “fo-erd” and it makes me insane. Why does the word “forward” turn up on every other page? Aaahhhh! Pass the Gilmore Girls boxed set, stat! I was hooked from the first book of Twilight too and proceeded to get my Sister in Law involved and a few friends. I love the little quote that you put in, Twilight truly becomes an obsession! While there is nothing like curling up with a good book I have become an audiobook junkie. This way I can engage with two favourite hobbies (reading and crafting) at the same time. Makes me feel like I am achieveing so much more. I am currently listening to the third of the Twilight series and it is a glorious way to pass an afternoon, sewing and listening (though I agree, the narrator of the Twilight books is TERRIBLE). 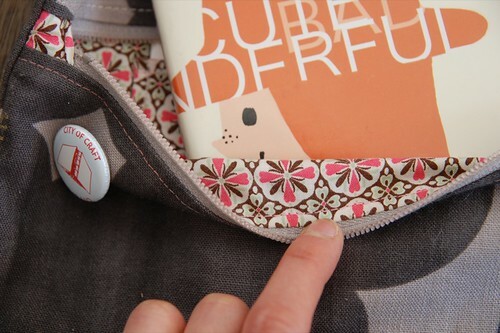 It’s funny because i’ve also been thinking about making a second version of the birdie sling… a grey version as well! I am (secretly) in love with grey right now: I love the way it matches red and yellow and blue and orange… and it’s so versatile and a great alternative to black. Ooh I saw your bag on the table today when I was sewing- meant to pay you a compliment. Looks gorgeous! Twilight completely consumed my life!! i was taking it to WORK!!! And sneaking in reading when my boss wasnt looking. hahaha, enjoy them ALL!! That quote inside a bag: such a good idea, having your own special touch were nobody is supposed to look make the intimacy of a hand back even more intimate and special. A friend of mine likened the Twilight addiction to being a crack addict. It is very true! Beware when you finish the last one, it is a sad moment when you realize that Edward is gone from your life. Though, if you go to Stephanie Meyer’s website there is a book started but not completed (there is a whole story there) taken from Edwards point of view. That is when you really fall in love with Edward Cullen! Karyn – it is a really beautiful bag!! the lack of space between velvet and voice seems like a perfect fit…I am starting the books next week and I must say this one quote already has me hooked…looking forward to having an unofficial book club discussion with you soon! haha, awesome! i’m glad you like the twilight books too! my friends make fun of me for it but whatever, i can’t get enough of swoony teen fiction! after hearing how much a couple of friends enjoyed Twilight, I started a borrowed copy last night. Two hours later, i dragged myself off to bed cursing my day job for forcing me to stop reading. Who knew I’d find it so fun? Who cares if it ain’t fine lit!? Besides, I’ll just blame reading it on pop-culture research because if you’re under 18 yers old it seems VERY important! Don’t see the movie! Don’t see the movie! Don’t see the movie! I have read the first two books (I loved them – I’m waiting for the next 2 from the library — I’m number 468 on the list, LOL).The movie just sucked. Can you unsee a movie? Although, I thought the actor who played Jacob was really cute……..
Oh gosh, my friends got me hooked on Twilight and now I have all the girls at work hooked on it. It was really depressing when I finished the last one. Hi! Just found your site and I love it!! Your new Birdie Sling looks amazing! I was thinking of making this bag, and I have heard that the pattern actually asks you to buy too much fabric. I read on someone’s blog they managed to cut 2 bags out of the required fabric. What do you think? ha! i bought the first book on sunday and i started the 3 today. and yes, my job is totally getting in the way. I am behind viewing your Birdie Sling. I am in the process of making it. It’s taken me ages, I’m not very quick. Do love yours. As for Twilight .. my 19 yr old daughter used to be a voracious reader of Pony Pals when she was young. Once she hit jr high we couldn’t get her to read anything. This year I text her (she’s on the east, I’m on the west coast), “I’m reading, shhh” .. now I get an order for two books of Twilight .. she has the video .. I mean I wanted her to read more but umm .. Twilight?? Love your blog.